Tropolism isn't sure what to make of these. They're models, plopped on the bay in Hamburg, taken with a close-up lens. Marketed as real. Hey, if Sciame can do it, why not the German prefabricated floating home company, or Floating Homes? 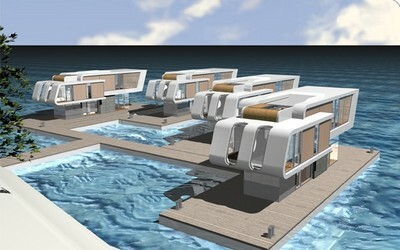 Floating Homes claims their first prototypes will be floating "at the 'City Sport Hafen' near the Hamburg Hafencity." More after you click on "continue reading". Usually, Tropolism wouldn't bother showing these off. Prefab concept house companies come a dime a dozen. In fact, let's start one right now! What's compelling about this one is that it appears to be something between a house boat and a floating house. They claim to have created a unique maritime structure that is neither house nor ship. Neither fowl, nor fish. What is also of interest is their aggregation. Although some of them appear to be arrayed armada-style, like a fleet in Star Wars on the way to attack the Death Star (I couldn't help it, the houses are named after letters too, and they're just as swoopy), some of the water configurations create interesting water spaces between them, like swimming pools. If you can't live on the ocean side of Fire Island, this may be an acceptable substitute.